I made some gift certificates if you still have last-minute Christmas shopping! They’re good for everything we sell at the shop, including design consultation, workshops, toolbox time, and materials. They’re laser-cut from 3mm birch plywood, measure about 10cm by 14cm, and will withstand significant handling. We have denominations of $25, $50, and $100 on hand. 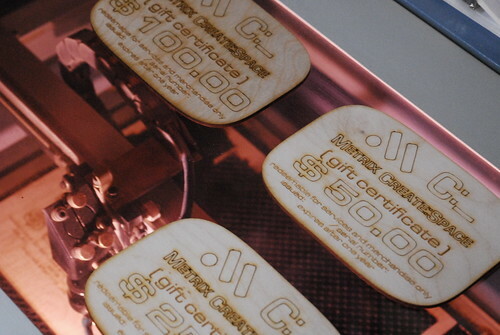 We can custom-engrave the back side for an extra-awesome gift! That shape, by the way, is a superellipse. It’s one of my favorite shapes. A regular rounded rectangle is what you get when you round off the corners of a rectangle; Inkscape’s rectangle tool has a knob you can twiddle to round off the corners. Where a roundrect has flat edges and elliptical corners, a superellipse has roundness all around but true elliptical curves nowhere. Inkscape unfortunately doesn’t have a superellipse tool, but there is an online plotter tool to generate SVG files that you can import directly.